We have been serving construction companies, contractors, farmers, and homeowners with quality lumber products in the Essex, Chatham-Kent, and Lambton area since 1989. From trailer decking, truck side boards, and horse fencing, to your premium kiln dried lumber theres only one call to make. 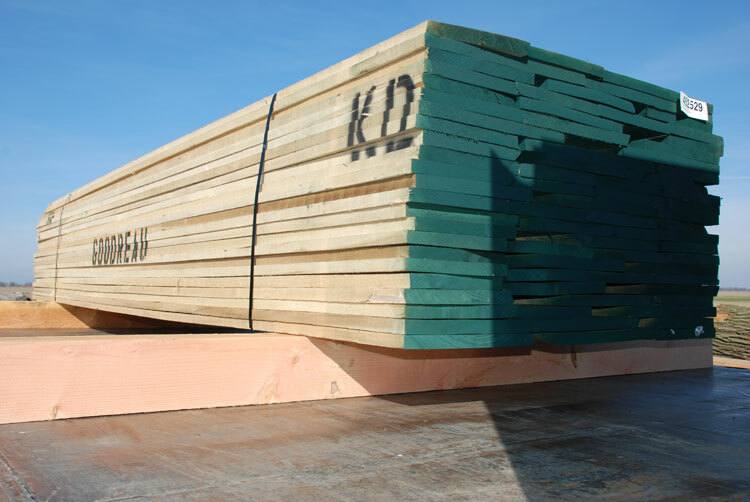 Here at Goodreau Sawmill, we have the most domestic species of lumber available in our area. Whether your building an outdoor or indoor project, we have your lumber solution. We can help you pick out the right lumber for the job, and hints on how to preserve your creation to give it years of endless beauty. An FAS board must be at least 6 " wide and 8' long. 83 1/3% of the board must be clear. To determine cutting units the maximum number of imaginary cuts is one-quarter of the board measure. For example, a 6" x 8' board is 4 board measure. The board can be cut only once, 1/4th of 4. After this single imaginary cut the board must be 83 1/3% clear. The area of each imaginary cut must leave at least 4" x 5' or 3" x 7' sections. If a board is 8 board measure then two cuts are allowed, yielding 83 1/3% clear, each cut at least 4" x 5' or 3" x 7'. If a single cut in a 6" x 8' board does not yield an FAS grade there are additional rules. One additional cut is allowed in boards between 6 and 15 board measure if the resulting clear portion of the board is 91 2/3%. The reverse face of a board must also be FAS for the entire board to be graded as FAS. A select board is graded exactly like FAS. The only difference is that the minimum size of a Select board is 4 " x 6' (whereas an FAS board must be at least 6" x 8'). The reverse face of a Select board can be either Select or #1 Common. A #1 Common board must be at least 3 " wide and 4' long. 66 2/3% of the board must be clear. The maximum number of imaginary cuts is one-third of the board measure plus one. Surface area after each imaginary cut must be at least 4" x 2' or 3" x 3'. For example, a board 6" x 8' is 4 board measure. One third of 4 + 1 is 1. If a single imaginary cut in the board yields 66 2/3% clear where the uncut area is at least 4" x 2' or 3" x 3', the board is graded as #1 Common. An additional cut in the board is allowed if the resulting clear yield is at least 75%. This applies to boards between 3 and 10 board measure. The reverse face of a #1 Common board is always #1 Common. A #2 Common board must be at least 3 " wide and 4' long, just like #1 Common. The clear yield of a board can be as low as 50% after cuts equal to half of the board measure. Surface area after each imaginary cut must be at least 3" x 2'. For example, a board 6" x 8 is 4 board measure and can be cut twice, half of four. The resulting clear area of the board must be at least 3" x 2' and at least 50% clear. An additional cut is allowed in boards between 2 and 7 board measure if the yield is 66 2/3% clear. The reverse face of a #2 Common board can be #2 Common or better. If the reverse face of a board is #3 Common then the entire board becomes #3 Common. Board feet is a unit of measure. A single board foot is one foot wide, one foot long and one inch thick or equivalent. For example, a six-inches wide, two feet long and one inch thick is also a board foot. To determine a board surface measure multiply its width in inches by the length in feet and divide by twelve, rounded to the nearest foot. 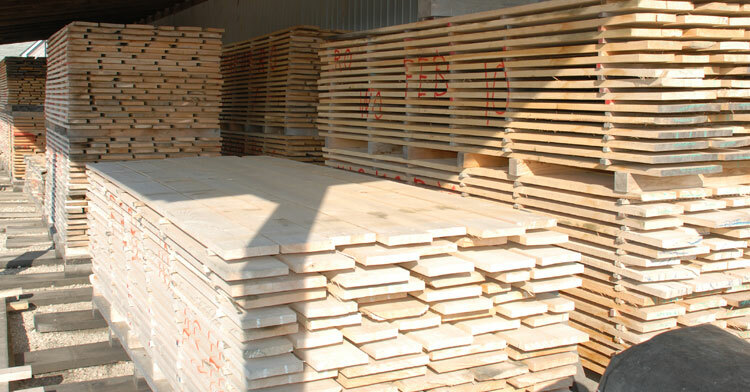 Lumber one inch thick or less are counted at surface measure. If a board is thicker than one inch the, surface measure (board measure of the surface) is multiplied by the thickness, in fractions of an inch, to calculate the true board measure. Sapwood and heartwood are allowed in any ratio. Any lumber order not specifically mentioning sapwood or heartwood, unless specificed by a particular grade, may have any amount of heartwood and sapwood. For example, a board entirely of heartwood, a board entirely of sapwood and a board half of each are identical. Unless a grade specifically mentions stain, no stain is admitted in surfaced stock. If stain is admitted in a grading, the stain cannot change the hardness of the wood. Mineral streaks and spots are admitted. Colour variation may be the result of mineral streaks and spots. Mineral streaks range from olive to brown to black. Plywood components that mirror adjacent components. All components are from the same log with grain matching nearly perfectly along the joints. Distortion of a board lengthwise. A bowed board is no longer flat across its length. A crack in the surface of a board. The crack does not go through the entire thickness of the board. It is a result of uneven drying, particularly by the sun. Distortion of a board widthwise. A crooked board is no longer flat across its edge. Distortion of a board widthwise. A cupped board is no longer flat across its width. Heartwood is the dead portion of the tree. It extends from the pith to the sapwood. It is usually a slightly darker shade than sapwood. The centre of the tree holds the heartwood. Discolored wood resulting from a branch. Red knots are living branches which the tree has overgrown. In Pine, red knots are usually sound and fixed since it grew until the tree was cut down. Black knots are dead wood, from dead branches, which are not necessarily fixed. Fixed knots are those which will only fall out of a board when under direct pressure. Discoloration of hardwoods ranging from olive green to brown to black. Knots upto 1/8" in diameter are considered pin knots. Pin knots in Pine are up to 1/2" in diameter. A portion of wood usually softer than the surrounding board. It occurs more often in heartwood at the center of trees. Pith that is equal hardness to the surrounding board is not a defect. The living portion of the tree extending from the heartwood to the bark. Sapwood tends to be more pale than heartwood. Seperation along the grain. It occurs most often between rings of annual growth. Discoloration in a board. This discoloration is different than sapwood, heartwood or natural variation. It ranges from pink to gray to brown. Distortion of a board both lengthwise and/or widthwise. A twisted board is no longer flat across its face. A lack of wood on the edge of a board. Wane may include bark. Wane is the result of a board being cut too close to the outside of a tree. A collective term for any variation in the flatness of a board. It can include bow, crook, cup and/or twist. Give us a call for all your wood timber needs, we got it in stock at prices that just can't be beat! "I have personally used Goodreau Sawmill for custom beam work at my home, and their products have become the focal point of our recent family room renovations. Kris is always our 'go-to-guy'"
© Copyright 2019. Goodreau Sawmill & Woodworking. All Rights Reserved. 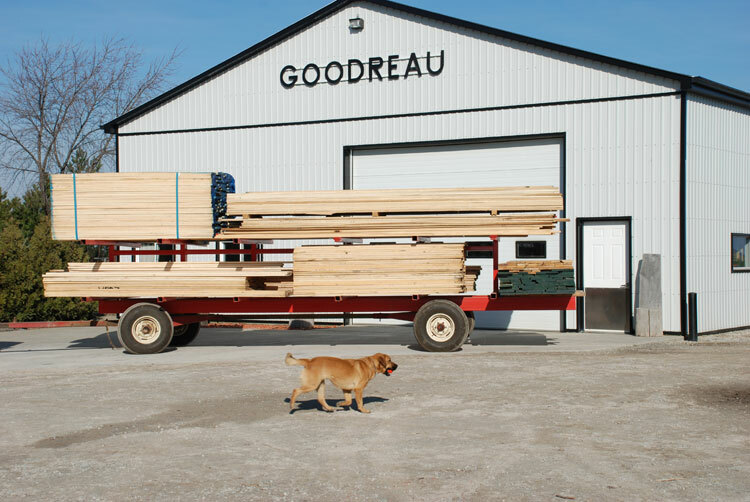 Goodreau Sawmill and Woodworking is your premeire source for buying Pressure Treated Lumber and Timber, Hardwood Flooring, Wood Mouldings & Wood Trim, Douglas Fir Timbers, Oak Trim, Crown Mouldings, Oak Hardwood Flooring and Custom Woodworking. We carry a vast line of wood species like Oak, Poplar, Maple, Fir and more. 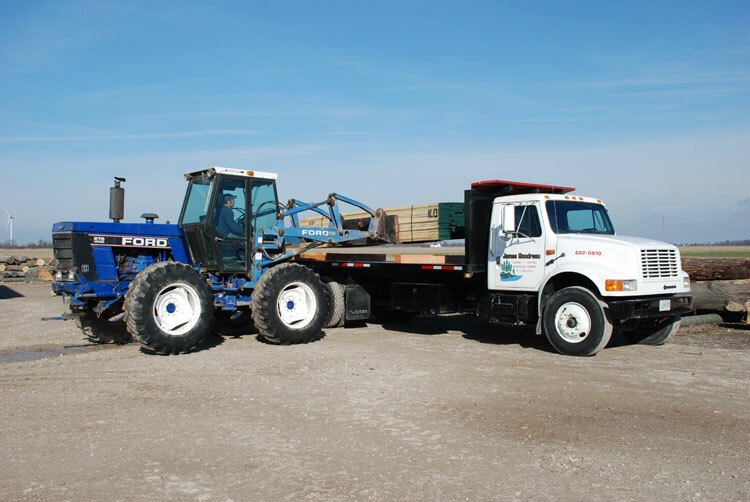 Our Sawmill is located in Tilbury, Ontario and have delivered wood products to all surrounding areas like Chatham-Kent, Windsor, Leamington, Belle Rover, LaSalle and Blenheim. Our experience, quality and millwork has gained us a reputaion of being the area's leader is top quality Canadian wood products.